The United Nations Security Council admitted Wednesday that humanitarian aid missions to war-torn Syria have failed - and that the situation is bound to get worse. Leaders of five UN agencies responsible for humanitarian relief painted a grim view of the hunger, poverty, and oppression in Syria in a joint statement Wednesday. “All too often, humanitarian access to those in need is being denied by all sides,” the agency chiefs said. According to the New York Times, the UN now estimates that the three-year conflict has left more than nine million Syrians in need of assistance. Of those, at least 3.5 million are trapped in cities under siege by shifting front lines and artificial famines. "The worst days seem yet to come,” they added. “Thus far, diplomatic efforts designed to end years of suffering have failed." The statement was signed by Valerie Amos, the Under-Secretary General for emergency relief ; António Guterres, the United Nations high commissioner for refugees; Anthony Lake, the executive director of UNICEF; Ertharin Cousin of the World Food Program; and Margaret Chan, director general of the World Health Organization (WHO). The announcement casts another dark shadow across hopes for improvement in Syria, after several announcements this week indicating the situation has worsened. Several reports of new chemical attacks in Syria are being investigated Wednesday, after video footage surfaced showing evidence that chlorine gas was released on civilians. Last week, rights groups claimed that the Syrian government dropped "explosive barrels that produced thick smoke and odors and led to cases of suffocation and poisoning" on the village of Kafr Zita. 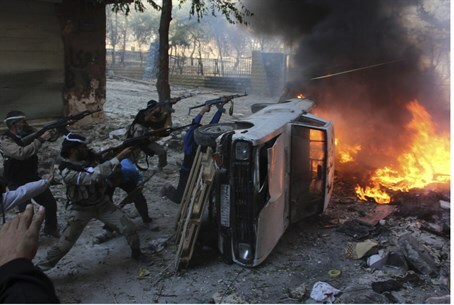 Damascus blamed the Al Qaeda-linked Al Nusra Front for the attack, which allegedly killed two people. Earlier this month, Israeli officials also claimed that another chemical attack had been launched in Syria - this time, in Damascus's eastern Harasta neighborhood. In February, opposition groups claimed the government had killed at least a dozen people with chemical weapons in the town of Deraya; in January, a group of activists and refugees went to the White House over claims of another gas attack in Damascus; the US has not acted on the charges.